I’ve always been one for a morning and evening beauty routine. I’ve said time and time again that the one thing I have never let slide since becoming a mother is time for ‘getting ready’ in the morning. I have always found a way – even if that means piling the kids into the bathroom for a sometimes ‘colourful’ half an hour, I have stuck to my guns and never missed a morning. To me, it’s important to start my day feeling good, and, showering, moisturising, doing my hair and putting on my face, is the best start to a productive day. I know it sounds so simple, but it’s one of those things that boosts my happiness! Body moisturising is one thing I will never go without. It’s a step in my routine that I know my skin thanks me for – here’s why I’m doing it and you should too! Repair – our skin takes a bit of a beating throughout the day with cold weather, pollution, stress and ageing. Moisture restores nourishment and hydration back into the skin, and doing it on a daily basis only puts our skin on the road to repair quicker. Think of it as a little barrier between your skin and the big bad world! Circulation – the action of applying body moisturiser improves the circulation of blood to the body helping to boost collagen levels. This means it helps lessen fine lines, wrinkles and saggy skin. Hooray for that! Timing – the best time to apply body moisturiser to the skin is when it’s freshly moist. Applying after a bath or shower and after towel drying the skin will really lock in that moisture. Heading into winter, most of us suffer from dry skin. Here are some dry skin hacks that might help! I find my feet and hands to be the driest of all. A little trick to do before bed, is to load up your feet with body moisturiser and put some socks on to really make the moisture set in overnight. You will wake up with the softest feet ever! For my hands, I like to keep a pump of moisturiser on my desk at the office and regularly pop it on during the day. If I’m at home, I apply it after washing my hands, washing the dishes or doing the laundry. The more body moisturiser the merrier! Try body moisturising before you shower! Hot water can sometimes dry out your skin, so applying moisture beforehand can help keep the skin full of hydration. Pay more attention to applying more body moisturiser on knees and elbows as it’s harder for moisturiser to penetrate those areas. Use an exfoliator to get rid of the dead cells. This will help the moisture go deeper into your skin. 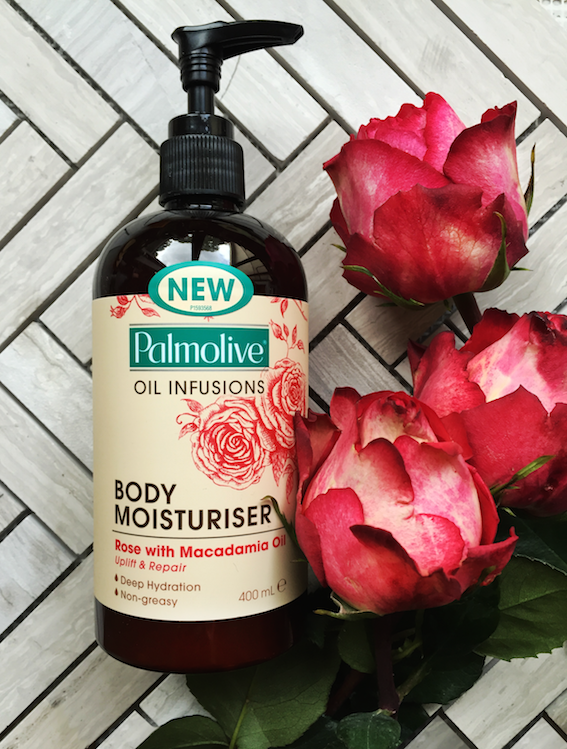 Palmolive has just launched their Oil Infusions Body Moisturiser within their new Oil Infusions range. It smells amazing and is the perfect little bathroom companion for the full body moisturising experience. It’s so important in life to find little moments in the day to reward, refresh and nourish your body and mind. I make sure I take some time in the morning, to set up my mind and body for the day. It’s surprising what a difference it can make! The Give Back – The Sebastian Foundation together with Palmolive will send ‘care packs’ featuring Palmolive’s new range to a series of Women’s Shelters, Young Girl’s Shelters and Women’s Aid Programs around Australia with a focus on NSW, QLD and VIC. We will also donate product packs to the programs that support women such as St Kilda Mums, The Dandelion Network, The Beauty Bank and more. An average shelter can spend between $2,000 and 5,000 per year providing toiletries for women in need. The donation will help take financial pressure off the shelters. 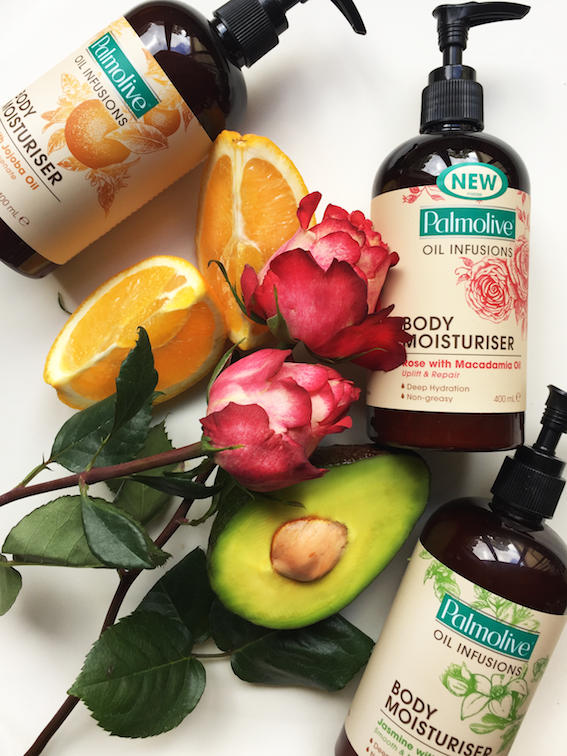 Palmolive Oil Infusions would love for you to share your own moisturiser moment by uploading a ‘public’ photo capturing how you take a moment to moisturise and give back to your skin and senses with hashtags #moisturisermoment and #palmoliveoilinfusions and handle @palmoliveanz. By uploading a photo you agree to the T&C’s. Best entry wins AU$1000, next 10 best win a AU$100 Coles Group & Myer Gift Card (Aus) OR Prezzy Gift Card (NZ), & next 100 best entries win 1 Palmolive Oil Infusions gift package ($102). Closes 5pm AEST 31/7/16. Judged 9am AEST 4/8/16. Winners notified via FB direct message by 8/8/16 & must respond within 14 days. Promoter Colgate-Palmolive P/L.